This statement makes complete sense to me if the camera is stationary. If I place my camera on a “perfectly aligned tracking equatorial mount” then theoretically a star would expose the same sensor throughout the whole exposure. Can I get more or brighter stars in that case? Yes, Bob. That is exactly one reason for using an equatorial mount. Beware, however, as you’re likely to discover that brighter stars are easy to “blow out”. That won’t matter much unless you’re eager to capture their color. By the way you played right into my plan since my earlier articles talk about astrophotography, and the most recent series about capturing the Milky Way also talks about tracked captures. Clear and useful, thanks. I just do not get why you would still use 500 (instead of 600) as the magic number at all? As solving for the 5D the above gives about 88, are you taking the 4-9 sensels per pixels into account to get to 500? It might be nice to create a simple list of magic numbers per camera/sensor; the above equation might be a bit overwhelming for some, but, say, 100/f=t is a lot easier to remember and use. Harry, Good questions. I actually started working on embedding an app in the page that would calculate the ideal time. The math is easy, but I’ve been too busy with other things – and it is painful to collect accurate data for every camera. I don’t recommend the 500 rule. I was revolting against the 600 rule which I found always streaked too much for my tastes. But as I state in the article, 500 is too much! The problem is that the “correct rule” depends on the camera and the desired aesthetic. Moreover, I also notice that people seldom understand or accommodate the effect of the “crop factor”. The point of this article is to show that there is a calculable maximum time, and everything beyond the maximum is an aesthetic judgment. E.g. for me, a smear of 5 pixels is too much, but I think a 2 or 2.5 pixel smear would normally be quite tolerable in nearly all display or print modes for an image. The Canon 5D has a pitch of 8.2 microns, so with a 16mm lens after 7.04 seconds a star at the celestial equator will have moved onto the next “pixel”. Allowing a dash of 2 to 2.5 pixels per star, the exposure time for the 5D to not noticeably streak is therefore 14 to 17 seconds. The rule 250/f would work for the 5D Whereas the same results on the 5DII would require a 210/f rule and on the 50D that rule would be 110/f. I vote for Harry’s “100 rule”, that says: “10 s for 10 mm”. It’s easy to remember, and matches quite well my experience. It may not be obvious from the article, but those who are plagued by gaps in their star trails may find that “doing the math” reveals the source of the problem. If, for example there is a three second delay between exposures (see How Long is a 30 Second Exposure), then that may well be enough time to skip all or part of a pixel. The relevant maximum streak length that you should allow is almost never a single pixel (or sensel, for that matter). The relevant quantity is the ‘circle of confusion’, which under usual viewing conditions is about 30 microns on a full-format camera. This is quite close to 4-5 pixels on the 5D, so the 30 second exposure from the “500 rule” doesn’t sound bad. Of course, it’s not adequate under all conditions, but it’s a good rule of thumb. Thank you for you comments, Tiberiu, though I’m not sure I agree. Circle of Confusion describes perceived sharpness and in particular why blurring occurs when something imaged spans more than one “pixel”. 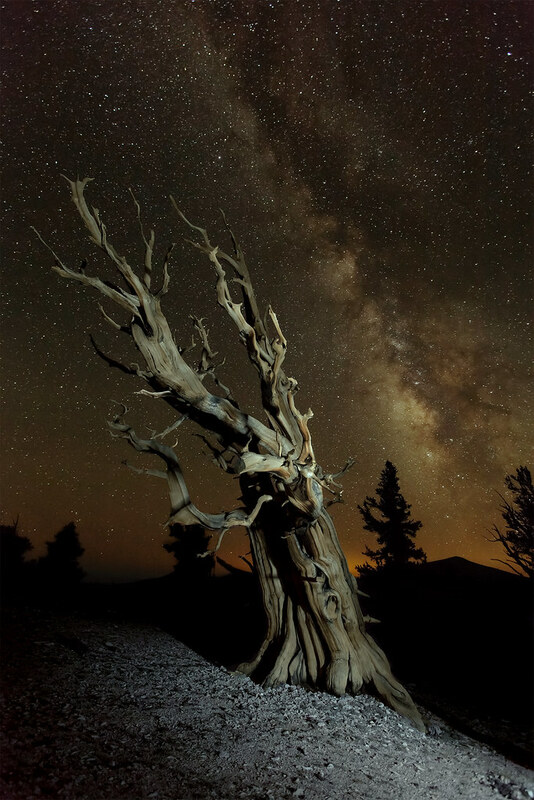 I have a 20×30 inch print of a Bristlecone Pine Tree with a Milky Way behind it. Even though it was taken at 30 seconds or less with a wide field on a full frame camera (well under the 600 or 500 rules), at a distance of 3 feet the stars are noticeably dashes rather than dots and because the angular speed of the sky is not uniform**, the dashes are not of equal length across the field. Of course I’m being picky. Your comment does, however, underscore my argument why the “600 (or 500) rule” can not be blindly applied to all cameras because of the large differences in sensor geometry. **The stars nearer to the celestial equator move farther across the sensor than those near the celestial poles in any unit of time. Steven, the calculation I alluded to has a number of assumptions, as outlined for example in the Wikipedia article. That said, unless you have superhuman vision, you won’t be able to see details much smaller than about 0.2 mm at a distance of 25 cm, or about 0.7 mm at 3 feet. Assuming a focal length of 10 mm on a full-frame camera and the maximal possible angular velocity (which is 1/13750 rad/s), stars take about 40 seconds to move that much. Now, of course, some of these numbers are somewhat subjective, and I’m not trying to tell you what you can or cannot see in a picture that you’re looking at and I’ve never seen. Like all rules in photography, this “6(5)00 rule” can’t be more than a rule of thumb, and experimentation should help you decide what works for you. My only point was that in most circumstances, there’s no reason to reduce the shutter speed to the point where the streaks are shorter than single pixels (or sensels). 1. Longer exposures don’t gain any more stars. Once stars have moved on to the next pixel(*) no additional photons at that site are being counted. 2. A full frame sensor and a 10mm lens is not typical. There are almost no full frame lenses at speeds of f/2.8 or better. Indeed nearly all 10mm lenses are for APS-C (not full frame) sensors where the geometry is less favorable. Steven, if you take a picture with a 50MP camera instead of 20MP, the maximum exposure time to avoid star trails will stay exactly the same, although the length of the trails in pixels will change; that’s because the limit is given by human visual acuity, and a pixel in a 20MP picture is already much smaller than the circle of confusion (CoC). Of course, the CoC will change in the obvious way if you crop the picture, or if you pixel-peep, or look at a huge print from a very small distance. But sensor resolution won’t change it as long as it’s above a certain threshold (which is probably in the range of 5-10 megapixels). If the camera is not full frame, you just need to multiply the focal length by the crop factor before plugging it into the “X/f” rule. Even if that were true, you might still want a longer exposure to get a nicer sky color, as you do in the picture you posted above — very nice picture, by the way. But also, while it’s true that the intensity of each star pixel no longer increases once the streak grows longer than a pixel, when you look at a print-out, you don’t see individual pixels. Your eye averages the intensity over an area approximately given by the CoC. As such, any trail that’s shorter than the CoC will look like a point whose intensity is proportional to the length of the trail. Here’s a figure that can help you test that. If you look at it from far enough away, some of the trails will look like points of different intensities, although all the pixels of all the trails are exactly as bright. That means longer exposure does buy you more intensity for stars, and implicitly, it can increase the number of stars that are visible in the picture, as long as the trails stay shorter than the CoC. I don’t see any night/star shots in your portfolio, so I’d like to encourage you to try some experimentation to see if your actual results match the theoretical values as closely as you think. Your theoretical arguments concerning CoC seem sound except that my experience tells me otherwise. Once a visual threshold is crossed it is not a matter of apparent sharpness. Though my eye might perceive a dash as a brighter element that element is no longer star-like. Also, be careful about assuming that the sensor density doesn’t affect the outcome. It does – though in an important different way then you’ve noted. Since the denser sensor has less area per pixel* every measured value is SMALLER than it would be on a less dense sensor, and thus all values are closer to the native sensor noise level. This reduction decreases the usable dynamic range just as any underexposure does. While the dense sensor has more adjacent pixels that somewhat offset the reduction in contrast, it doesn’t really buy much else. Assuming only the sensor density is increased the star streaks now cover more pixels. As a result one CANNOT make a larger image from the greater density image unless we move people proportionately farther away. My clients hang 11×14 or 20×30 or 40×60 prints on their walls but they don’t stand farther away to view them! 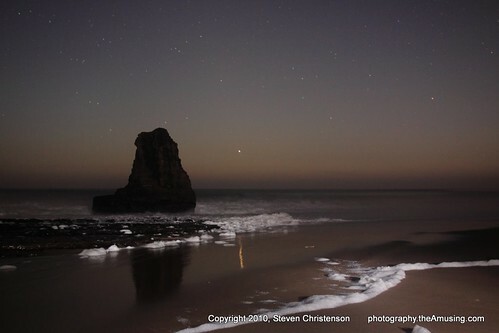 Even ignoring the streaking issue in any night sky image increasing exposure time is usually not an effective solution. 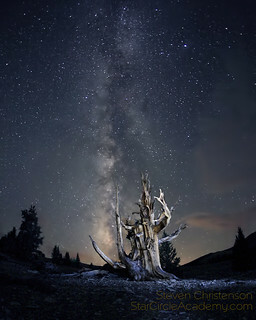 A longer exposure results in more accumulated skyglow and thus a reduction in the overall contrast between the stars and the sky. I found this out the hard way when trying to collect meteors. Long exposures miss fewer meteors, but they also allow the sky glow to overwhelm the dimmer meteors. That math is all great but practically you end up using around 30s shutter speed anyway (for Milky Way and meteor shots) with a wide angle lens (20’s and lower) the only thing you may change is the aperture and ISO. With 35mm and longer effective focal length it’s difficult to compose Milky Way shots or catch meteors. That means you will always have star streaking except you use a camera tracking device. As a result of my work, I’ve found that you can get good results with lower shutter speeds (15 seconds to 20 seconds). It means more processing, but it is nigh impossible to remove streaks after the shot as compared to boosting contrast and lightness on a shorter shot. Of course it’s important to have a camera capable of good high-ISO performance. For example I shot this at 25 seconds, 15mm rather than the 30 seconds to which I had become accustomed. 25 seconds at 15mm meant 1.5 pixels less streaking. At this size the streaks are not at all obvious but when printed large you will definitely notice. – The distance travelled by a star on the sensor depends on the actual focal length of the lens, not its effective focal length (the laws of optics don’t know about our preference for the “full frame” sensor). The crop factor was added after the fact in the equation, to take into account the extra magnification that will be required for a smaller sensor when displaying the image. You’re most probably right to do so, but then d is not “the distance … that a star travels across a sensor”, as stated in the text. It’s an effective distance if you like, obtained after the camera sensor has been stretched to the size of your reference sensor. 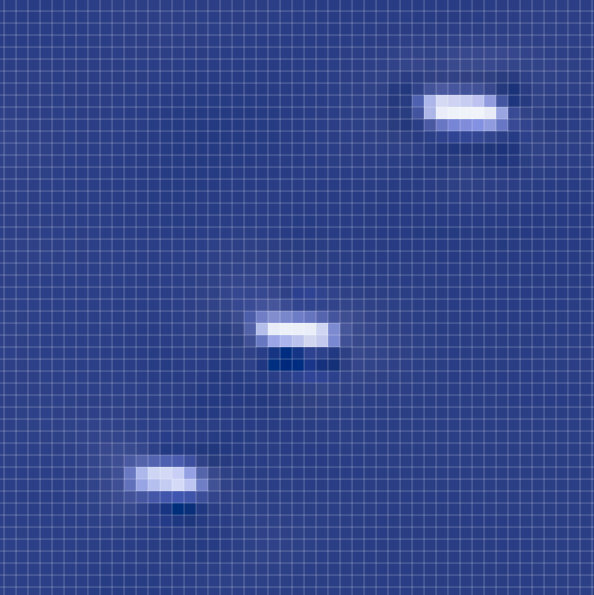 Knowing the physical size of a pixel on the sensor, the number of pixels crossed by a star is obtained from the physical distance travelled (computed without the crop factor). Then, the acceptable number of pixels, for a streak to be unnoticed, does depend on the crop factor (amongst other things). – As you know, stars have different motions depending on their declination. There is a factor cos(δ) in the general equation, that was here implicitly chosen to be equal to one. So d is not the distance travelled by “a star”, but by a star at the equator. It is also the maximum distance travelled by any star (from which you can derive the maximum exposure time, as wanted). This is clarified elsewhere on the page, but regrettably not when the equation is introduced. – The number “13750” is actually an approximation of 86400/2π, the inverse of which has a simple physical meaning: it’s the angular frequency of stars at the equator (in radians per seconds). I hope these remarks can help you further improve your great teaching material. You are correct! I tried to avoid all of the details that seem irrelevant. I clearly stated that the remarks addressed a star at the celestial equator because it’s the worst case that matters. 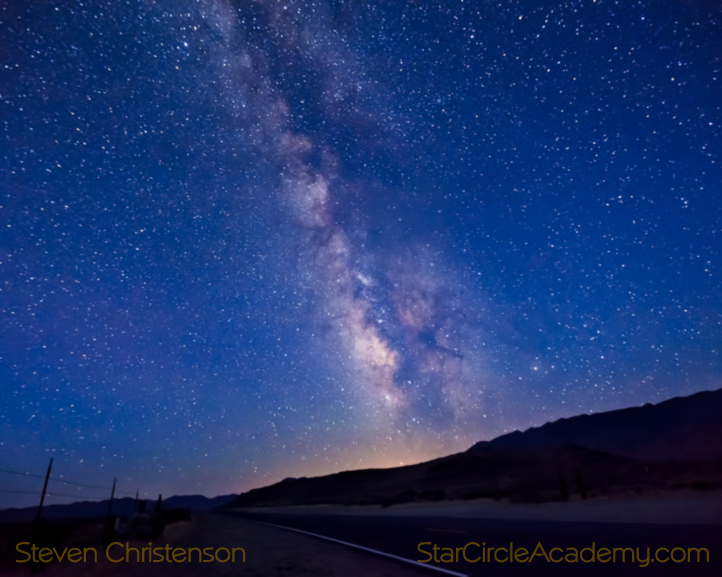 The star declination is irrelevant for nearly all wide field landscape astrophotography where a field of view of 60 to 120 degrees includes stars at nearly every declination. Based on the questions I get, it’s clear the average reader doesn’t think about (or want to think about) how the direction they aim their camera will affect the outcome. I did make an unstated assumption which I should have set forth: regardless of the size of the sensors used to obtain the image in the end we will be comparing finished images of the same size viewed from the same distance. The “effective distance” as you’ve called it brings all that together. @Jay, Unfortunately, I’m too lazy to look up the specifications of the D800 sensor 🙂 and you haven’t specified what focal length you will use, how big you plan to make your finished image or how far you’ll stand away from it. But don’t worry, as I noted in the article the length of exposure is about aesthetics. Start with the 500 rule, check your results and then change your settings as necessary. Here is some quick help: 500 / 14 = 35; while 500 / 24 = 20 seconds. This is a fascinating discussion. Thanks for sharing your findings. I am a novice at shooting astrophotography and have been following the 600 rule but not thrilled with streaking. I am going to try a little experimenting with your formula. shooting with the 5D III it might buy me a little higher ISO. A simple way to calculate the “rule” for any given sensor is: pixel pitch * 34,375. If you need to calculate the pixel pitch it’s: sensor width / pixels. For the D800 that is 35.9mm divided by 7,360 pixels. The “pixel to pixel” distance (aka pixel pitch) per the calculation above the D800 pixel pitch is 4.88 microns. Using the formula in the article the time it takes for a star at the celestial equator to move from one pixel to the next is: 0.00488 = t * f / 13750. After 4.8 seconds at 14mm or 2.8 seconds at 24mm, a star has moved an entire pixel. Allowing for 2.5 pixel streaking as I described earlier means at 24mm the limit is about 7 seconds. The net result is that the “170 rule” could be used with the D800. But remember this is an AESTHETIC choice. what about the different speeds of moving stars ? All stars closer to Polaris (which is acually “sill” on the sky all night) will move slower, when the other further away will move faster… – i think you will need to adujst the “rules of whatever hundreads” to the part of the sky you shoot. Only solution is to take test picture and use 1:1 preview on the screen, or you tablet or laptop to zoom in and check the trails. TIP2: use you smartphone and “night sky app” like to check the starts positions as to judge how close are they to polaris. The calculations in the article assume stars at the celestial equator where the apparent motion is the fastest. But there is little point fixating on that since most people shoot the night sky with wide angle lenses. In a wide angle lens the sky may include everything from Polaris (which is not still since it’s not ON the north celestial pole though very close) to stars along the Celestial Equator where the sensor speed is the greatest. As we asserted, and you pointed out, blind adherence to a rule without understanding what underlies it will lead photographers astray. I am just starting to enter the realm of long exposure photography, and I am a little confused why this is the procedure followed by professionals for star trail photos. I read a lot of other blogs and everyone seems to be following the same procedure: take a lot of photos in burst mode, each one with a shutter speed of 30 sec. Ash, your question is better directed (and perhaps already answered) HERE – especially in the “Pros and Cons” table. We are certainly not opposed to any method to capture the desired results, however! Was messing around with the same stuff basically, and that’s without even having acquired a camera yet. basically I was interested in how well the sony a7s would do with astrophotography, so I started looking into it. The 600 rule of course seemed to simply at first, but I accepted it anyway. Then I stumbled upon the 500 rule, and decided to figure out the perfect exposure time for myself. I’ve done it a bit different than you, and I think the result is more precise, though perhaps I’m wrong. So, using this approach, given the example with the 5d mk.ii with a full frame 21.1 mp sensor and a 16mm lens, that gives us a total exposure time of just 3.8 seconds. In case of the sony a7s, with the same lens, that time would be around 5 seconds. Can’t say i’m too happy with that, as I actually intent to use a 35mm lens when that time comes, and that again only gives me ~3 seconds. had hoped to be able to take some 15-30 seconds exposures, but that’s simply not possible, even with the most obscenely wide lens. The good news of course is that even at 110mm, in case of the a7r, you’ve still got a second of exposure time to play around with, and as for the canon 5d mark ii that limit is about 85mm. I didn’t carefully check your math, but the point of the article is that the amount of streaking you obtain is calculable but that amount of streaking that is “tolerable” is subjective. The other point is that the time to streak is a LOT shorter than most people realize. For astrophotography (as opposed to Landscape Astrophotography), all streaking is bad which is why nearly any exposure should be made with a device that tracks the rotation of the earth. You see that these figures are slightly above the one you calculated, just because your calculation did not take into account the real size of the star on the sensor (remember Airy) and the spreading due to the CFA (bayer) interpolation. Thanks for the details, Fred. We are curious, however, about the airy disk size. According to our calculations, at f/2.8 or smaller the Airy disk on a 5D Mark II would be half the size of a “pixel”. Also, thanks for including the formula for objects at the celestial equator. As has been discussed earlier, a wide angle lens is very likely to include stars near the celestial equator. Steven, I’ve been doing night sky photography for almost three years now and have learned a lot from the articles here. Thank you for providing such useful information. I recently made a discovery related to the length of a star trail when it is reflected in water. It seems that, while the stars in the photo linked below show a little streaking, the stars reflected in the water show much more. I shot this photo using a 21mm Zeiss lens, a Canon 6D camera at f-4 and 15 seconds. The brightest stars in the sky seem to be around 12 – 15 pixels in width and length. Those reflected in the water are 30 pixels in length. The streaking is fairly obvious. You are the night sky guru. Can you explain why the reflections are so streaky? is it because the reflections are close and have the same effect as if I was using a longer lens? If I cut the shutter speed in half, would the reflections be half the length? I always appreciate the fact that you take the time time to respond to inquiries. All of the lights are stationary… but at low angles, they form long reflections. Even though the object is a point light source, your camera (and your eye) are not so you can see every possible angle that intersects the camera. From physics: the angle of reflection is equal to the angle of incidence. There is more than one angle in which the reflected light will enter your iris – that is, where the angle of reflection equals the incidence angle. You can prove this yourself by looking at a mirror at a very shallow angle and notice that some of the reflected objects are distorted. I put a penny on my desk, and put a mirror in between that I tipped up so that I could see both the penny and the reflection of the penny. As I change the angle of the mirror, the reflection of the penny grows thinner or thicker – just as the reflection of a star would at various angles. If I am understanding you correctly, the length of the reflection isn’t due to the length of the exposure and cutting the shutter speed in half won’t reduce the length of the reflection. 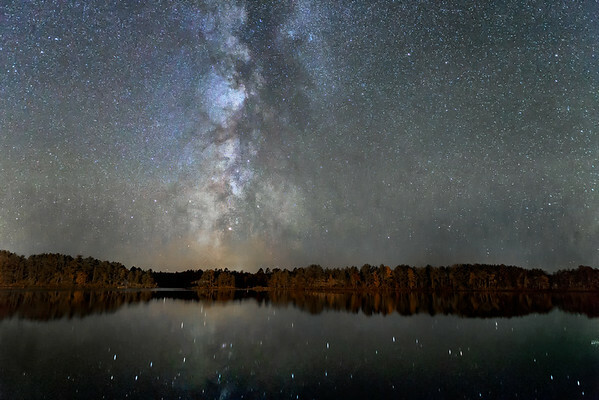 Furthermore, the reflection isn’t something that we should expect to be a pin point like we want our stars.We should ordinarily expect to see reflections that are longer because of the angle of reflection. Is that a correct understanding? Thank you again for being so willing to respond to those of us who are not so scientifically inclined. 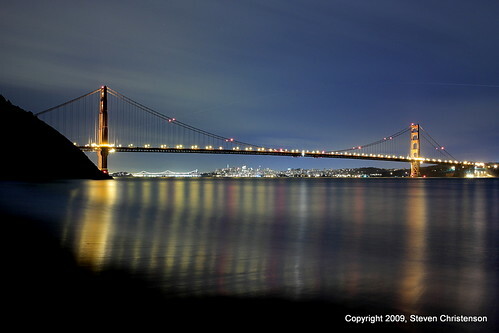 Note that waves or ripples in the water will increase the streak length because there are more points for the reflection to occur (as per my Golden Gate Bridge photo).